Pamela's family is told there are no skunks in Nova Scotia, but one morning Pamela wakes up to discover that her house and her entire family smell like skunk. The smell is so terrible that nobody will sit beside Pamela at school or on the bus, and Pamela's dad delays a flight to Toronto. They set a trap underneath the house and release the skunk in the wilderness, but the next morning there is another skunk, and the morning after that there is yet another. The family finally catches and releases sixteen skunks. By the time the last skunk is gone, Pamela has learned to like the black-and-white striped animals. 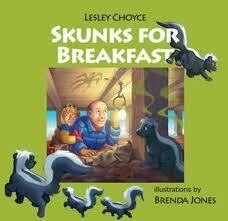 The story is inspired by Nova Scotia author, Lesley Choyce's real-life experience, and based on his 2002 film The Skunk Whisperer. The illustrator, Brenda Jones, is from Prince Edward Island.